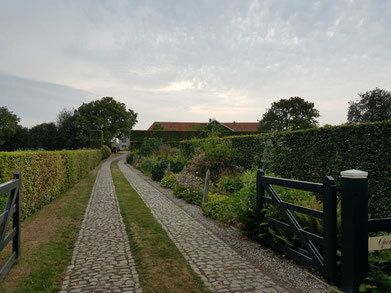 The driveway to Piet and Anja Oudolf's private garden in Hummelo. 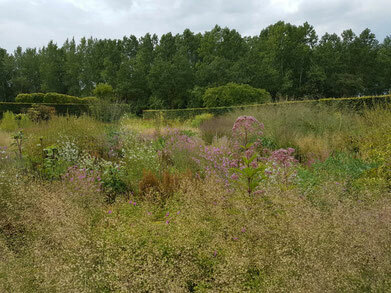 Despite a forecast for rain, we set off yesterday for Hummelo, a two and a half hour drive, to visit the garden of Piet and Anja Oudolf. The last time I visited was 6 years ago, after Piet and Anja had just ripped out the iconic yew waves at the bottom of their garden and built Piet’s atelier. It was spring so what we saw were the bones of the garden. The beech hedges were brown, in their winter dress, but the shapes were strong and clear. 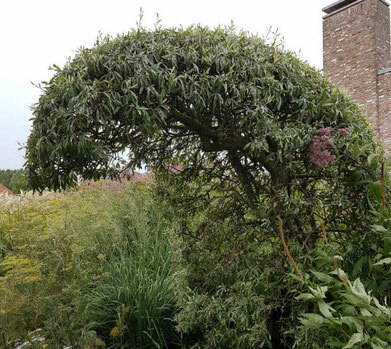 I particularly remember the pyrus salicifolia trimmed in the shape of a standing comma. I had always wanted to visit the garden in summer, when the grasses and perennials are at their best. 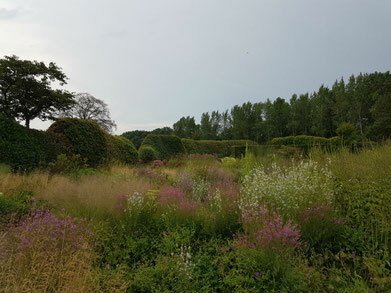 Typical of Piet’s naturalistic style are generous sweeps of perennials and grasses in unusual combinations. These paint a moving picture, where texture, shape and color of both blossom and foliage are used to subtle effect, as the wind gently (or not) catches the stems of flowers and grasses. In summer, the plantings are so tall and full that they literally engulf the visitor. I even felt a bit disoriented. One enters the garden through a passage in the outer beach hedge. A brick path clearly shows the way, taking the visitor left or right down a winding path. The plantings thicken as you progress down the path, so that the bricks become invisible and the plants engulf you, transporting you to a different plane. The experience is highly sensual. You hear the grasses swish as you move by. They also emit a particular scent and brush against your body, not just your legs, as you pass. The blossoms, all different shapes, seen through the veil of the grasses’ thin stalks, are at eye level. Looking upwards is like coming up for air. There is the green of the large hedges which form the outward boundary of the garden! Their solid mass against the sky provides an anchor as we proceed on, cresting wave after wave of transparent grasses, large umbellifers, smaller flowers, dark and light stalks, soft and spiky seed heads. At the bottom of the garden, where the yew waves once stood, is a small grass area with a bench . It is peaceful to sit there and look back at the house, barely visible over the tall plantings. Behind the house, where the nursery once stood, is another garden adjacent to Piet’s studio. It looks flat until you explore it and realize it is actually up and down. There, barely visible among the exuberant summer plantings, I found the pyrus salicifolia comma which had stood out on my last visit six years ago. 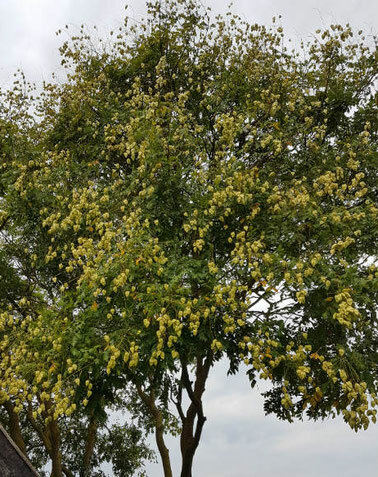 My highlight was the Koelreuteria paniculata tree, growing by the barn where Anja awaits the visitor. It was covered with large white seedpods and looked very decorative. I picked up a fallen seedpod…Perhaps I can try and grow one from seed? It will be my very own souvenir of the Oudolf garden in Hummelo! 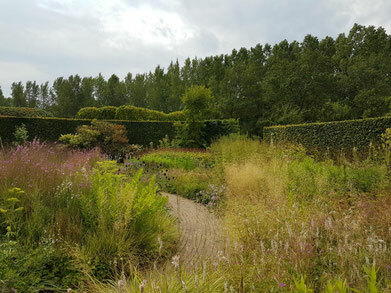 Piet Oudolf is world-famous for having introduced the so-called New Dutch Wave style. His commissions include the Battery Park and the Highline in Manhattan, the Lurie Garden in Chicago, public parks in Germany, Sweden and the Netherlands. For many years his garden in the small town of Hummelo served as an experimental ground for his new design style. 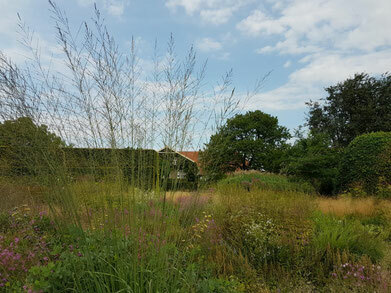 He and his wife Anja ran a nursery, selling the perennials and grasses Piet uses in his designs. The nursery is now closed and this is the last season the private garden will be open to the public. The garden is open until October 27 2018, from 11AM to 4PM Thursday, Friday and Saturday.